Hezbollah's leader said Friday that his group is ready for "open war" with Israel, and as his words were broadcast, guerrillas attacked an Israeli warship that had been firing missiles into southern Beirut. Speaking defiantly in an audiotape on Hezbollah's Al-Manar television less than an hour after missiles destroyed his headquarters and home, Sheik Hassan Nasrallah addressed himself to Israelis and said they must take responsibility for their actions. "You wanted an open war, and we are heading for an open war," he said. "We are ready for it." Meanwhile, Israeli rescue services said a mother and her daughter were killed in a rocket strike on northern Israel on Friday. Israeli warplanes smashed runways at Beirut's airport with hours of airstrikes, trying to render it unusable, and destroyed mountain bridges on the main highway to Syria. Warships blockaded Lebanon's ports for a second day. As attacks on both sides continued, Nasrallah vowed to inflict more damage on Israel. "The surprises that I have promised you will start now. Now in the middle of the sea, facing Beirut, the Israeli warship that has attacked the infrastructure, people's homes and civilians, look at it burning," Nasrallah said. "It will sink and with it will sink scores of Israeli Zionist soldiers. This is just the beginning," he warned. The warship was hit off the Lebanese coast by an unmanned Hezbollah aircraft rigged with explosives, military officials said. The attack indicated that Hezbollah has added a new weapon to the arsenal of rockets and mortars it has used against Israeli troops. The army said the warship was lightly damaged in the attack, though the Arab satellite channel Al-Jazeera reported the Israeli military was searching for four missing sailors. The military officials spoke on condition of anonymity because they weren't authorized to speak to the media. The army spokesman's office would say only that the cause of the attack was still under investigation. Hezbollah has managed to fly unmanned spy drones over northern Israel at least twice in recent years. Immediately after Nasrallah's message was broadcast, Arab television showed nighttime video of what it said was the Israeli warship burning. But the video was unclear. CBS News correspondents Steve Kathan, Kristin Gillespie, Robert Berger and Cami McCormick report. The audiotape came shortly after Israeli missiles struck Hezbollah headquarters and Nasrallah's house in southern Beirut. His comments, however, apparently were prerecorded, and Nasrallah did not refer to the missile attack on his offices and residence. Surging oil prices caused by Middle East violence pulled stocks sharply lower for a third straight session Friday, with bland earnings at General Electric Co. and weak consumer data further dampening the economic outlook. The Dow Jones industrial average shed 396 points in the past three days. Crude futures reached an intraday record of $78.40 a barrel and eventually settled at $77.03 a barrel, up 33 cents, on the New York Mercantile Exchange. The United Nations Security was holding an urgent meeting, reports CBS News correspondent Cami McCormick. Lebanon wants an immediate ceasefire and a lifting of Israel's air and sea blockade. Israel's ambassador said Lebanon has had many opportunities to rid itself of terror groups, and now finds itself hostage. Israel will not halt its offensive in Lebanon until Hezbollah guerrillas are disarmed, Israeli Prime Minister Ehud Olmert told U.N. Secretary-General Kofi Annan by telephone earlier Friday. "The biggest problem for the U.N. in trying to diffuse the crisis in the Middle East is that the violence is caused by terrorist groups, not states," said CBS News foreign affairs analyst Pamela Falk. At the southern end of Gaza, hundreds of Palestinians poured into the Gaza Strip from Egypt on Friday after militants blew a hole in the border wall. The border has largely been closed since June 25, when Palestinian militants carried out a cross-border raid on a military outpost, killing two Israeli soldiers and capturing one. Hundreds of people have been stranded on the Egyptian side of the border, unable to get to their homes in Gaza. Israel's army chief said Friday that Hezbollah guerrillas have rockets that can reach as much as 40 miles or more, an admission that brings more major cities within their range. In comments that were aired live on Israeli television, Brig. Gen. Dan Halutz also put the blame squarely on Lebanon's government for the numerous rocket attacks on northern Israel that have killed four people and injured several more. Israeli jets also struck the Beirut-Damascus highway again, this time in the town of Chtaura in the Bekaa Valley in eastern Lebanon. Two missiles hit a main intersection on the edge of the market town that connects central, northern and southern parts of the Bekaa with central Lebanon. Residents of Haifa, Israel's third largest city and a major port, were ordered into bomb shelters as evening fell Friday, following rocket attacks throughout the day, even though Haifa is some 18 miles south of the border with Lebanon. Residents were shocked when the first attacks hit Haifa Thursday: No guerrilla rocket had ever reached that far into Israel. Throughout the country, two Israelis have been killed and dozens wounded by the more than 60 rocket attacks since Wednesday. Along Israel's northern border, hundreds of thousands of people now are living in bomb shelters, reports CBS News correspondent Richard Roth. Hundreds of Hezbollah rockets have fallen there in the last two days, and Israelis are stocking up. They don't expect it will end soon. Israeli fighter bombers also blasted the airport for a second day, ignited fuel storage tanks and cut the main highway to Syria. President Bush promised Lebanon's leader Friday that he would urge Israel to avoid civilian casualties and damage as it steps up attacks on its neighbor. But Mr. Bush's promise to Lebanese Prime Minister Fuad Saniora fell short of his request for pressure for a cease-fire, according to an account from Saniora's office. "At this point, the Israeli leaders have been consulted. They've been consulted by the secretary of state and the national security adviser," White House spokesman Tony Snow told reporters in St. Petersburg, Russia. "The president has not expressed any plans to speak with the (Israeli) prime minister but should it become necessary, he will." The president also talked to the leaders of Jordan and Egypt, reports CBS News White House correspondent Peter Maer. Beirut airport officials said one of their three runways was hit by two Israeli missiles at mid-morning Friday. The airport had been closed since Israeli fighter-bombers struck its runways early Thursday. With aviation fuel on fire and runways in ruins, Israel has been choking off transport in and out of Lebanon, reports Roth. 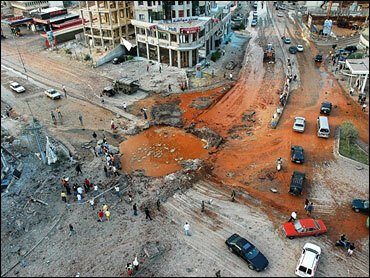 Bombs hit the highway linking Beirut with the Syrian capital of Damascus. Travel is only possible now along tortuous mountain detours. Debbie Nassif, a Lebanese-American who has been visiting her family in the Bekaa Valley, is stranded. "I was leaving tonight. And now, I have no clue how I'm going to leave, when I'm going to leave, from where," Nassif said. "We can't even go to the Syrian border, because we called the U.S. and Canadian embassies, and they recommend not going to the Syrian border." A senior State Department official said the best advice for the moment is for American citizens to stay where they are and to let the U.S. Embassy in Beirut know how to reach them if they have not already done so, reports CBS News' Charles Wolfson. Israel says the air and naval blockade will remain in force until Hezbollah is driven out of South Lebanon, reports CBS News correspondent Robert Berger. The overnight death toll brought to 61 the number of people killed since Wednesday when Israel began retaliating for the capture of two Israeli soldiers by Hezbollah guerrillas in a raid across the southern Lebanese border. Sixty of those have been civilians, only one a militant, Lebanese authorities say. "Hezbollah wants to assert its primacy in the anti-Israeli forces. Iran and Syria are clearly using Hezbollah as a vehicle to get at Israel," Richard N. Haass, president of the Council on Foreign Relations, said on CBS News' The Early Show. Israel's offensive had several goals: to pressure Hezbollah to release the Israeli soldiers, to push the guerrilla group away from Israel's northern border and to exact a price from Lebanon's government for allowing Hezbollah to operate freely in the south.